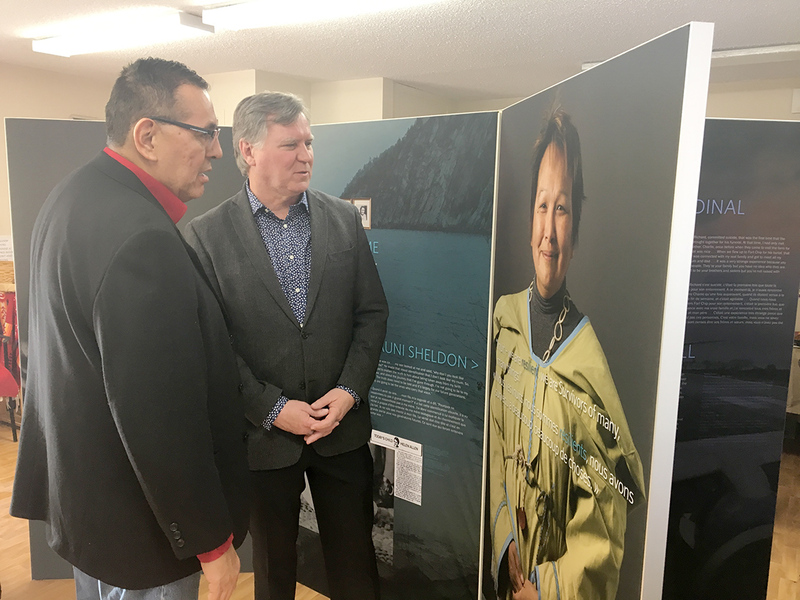 Minister Richard Feehan and Adam North Peigan at the sneak peek Sunday of Bi-Giwen: Coming Home – Truth Telling from the Sixties Scoop exhibit. Bi-Giwen means coming home. It’s what you yearn for as a Sixties Scoop survivor; coming home and being welcomed back, said Adam North Peigan, president of the Sixties Scoop Indigenous Society of Alberta. On Sunday, Jan. 20, North Peigan attended the opening of the travelling exhibit Bi-Giwen: Coming Home – Truth Telling from the Sixties Scoop. It was set up in Edmonton for a single day before the tour of Alberta begins in February. Bi-Giwen will be in the province for nine months. Bi-Giwen documents the atrocities and the trauma that Sixties Scoop survivors had to endure throughout Canada, North Peigan explained. It provides an opportunity to share and educate Albertans about the history of Canada's Indigenous people in relation to the Sixties Scoop. The Sixties Scoop refers to government practices across Canada from the 1950s to the 1980s that led to an unknown number of First Nations, Métis and Inuit children taken from parents, families and communities by child services. Those children were placed mostly with non-Indigenous families. North Peigan says there are many thousands of survivors. Many of the children experienced abuse, mistreatment and neglect, and lost touch with their families, communities, culture and traditional language. The exhibit is a next step in the effort to change the circumstances that led to the Sixties Scoop, said Indigenous Relations Minister Richard Feehan, including addressing the pain and the grief that has been experienced by the survivors. In May 2018, Alberta Premier Rachel Notley provided an official apology for past practices that led to the removal of Indigenous children from their families, resulting in the loss of their culture, identity and connection to their communities. The apology was a remarkable day, a historic day, said North Peigan. “What that apology did was that it opened the doors for the work to begin. And that’s.. part of what’s happening today,” he said about the sneak peek of Bi-Giwen. Next steps have included training for the public service in the history and culture of Indigenous people, and education about the Sixties Scoop to the wider population. “The rest of us need to go through a transformation as well; a transformation of understanding,” the minister said. The province has put funding toward language recovery, and has created an anti-racism program to help transform the relationship with Indigenous people. “It you truly understand and know about the history of this province, you will help us make better decisions moving forward. The exhibit was developed in Ottawa by the Legacy of Hope Foundation, but Alberta is the first to tour it. “I’d like to think that Alberta is leading the charge as far as reconciliation for the Indigenous peoples in Canada when it comes to Sixties Scoop,” North Peigan said. It was very gratifying to see the exhibit, he said. North Peigan was one of 12 survivors who was asked to go to Ottawa to share their stories, which are included in the exhibit. North Peigan talked about the influence Sixties Scoop survivors hope to have on child welfare reform in this current era known as the Millennium Scoop, where large numbers of Indigenous children are being taken into government care. He said his society is working closely with the Alberta minister of children’s services. He said the society is very pleased to be at that table. There is a Sixties Scoop western gathering for survivors being planned for May, expected to be held in Saskatchewan, but a location has not yet been announced. On Jan. 7, Saskatchewan Premier Scott Moe also issued an apology to Sixties Scoop survivors in that province.